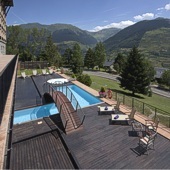 The Parador of Vielha has unsurpassable panoramic views of the Pyrenees, which may be enjoyed by residents from the circular glazed living room. The bedrooms are spacious with desks and leather chairs. From most bedrooms and from the terraces there are delightful views to snow capped mountains, tumbling streams and distant villages. The swimming pool is seasonal (interpreted by the management as being open in July and August!). It is in the well looked after gardens with spectacular scenery. 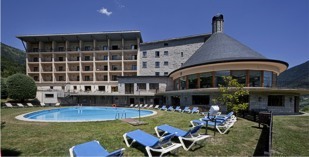 Vielha Parador has recently incorporated a spa which is available at an extra charge. This spa has a heated indoor and outdoor pools featuring a variety of services such as massage, Scottish shower, sauna, jacuzzi, beauty treatments, etc. The spa complex is open every day from 11:00 a.m. to 9:00 p.m. Sundays without treatment service. Vielha has a rich historic and cultural heritage. Visit the Romanic churches of the 12th and 13th centuries, the folk museum, and the iIce palace. The main festivals in Vielha are for the local saint held on September 8 and the Fair on October 8. The Battle of Flowers should not be missed in the month of August. In winter all the main activities in the Aran Valley are snow oriented. There is alpine skiing, cross-country skiing, and snow boarding. During the rest of the year there are several enjoyable excursions to be made including a visit to the lakes of Colomer and Saburedo, which are approximately thirteen kilometres from the Parador. The Parador Vielha has seventy seven twin bedded rooms, thirteen rooms with a double bed, twenty two duplex suites, two suites and four easy access rooms. All the rooms have a private bathroom. 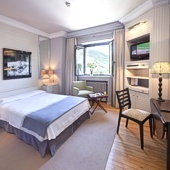 a telephone, television with canal plus, satellite television, safe and a mini bar. Special rooms for the disabled are available on prior arrangement. The Parador has air conditioning and central heating, currency exchange, lift, garage, parking facilities (without security and limited places), piped music, satellite television, gift shop, restaurant, bar and facilities for the disabled. Other facilities include a children's playground, a games room and a seasonal swimming pool. Distance from the nearest airport is approximately 150 kms away and the closest train station is 145 kms away. Nice hotel and nice rooms. Most of the team didn't speak English. Most of the people in the reception couldnt give recommendation about activities in the area. Food was nice. Location good. 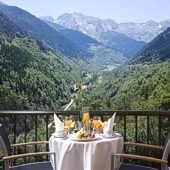 Parador de Vielha is a four star hotel in the Parador group in the Catalan Pyrenees.